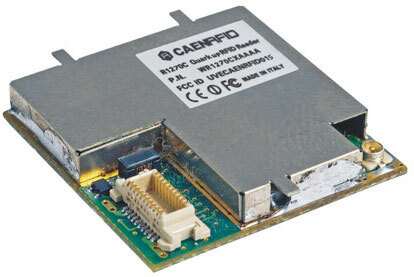 The Quark-Up (Model R1270), OEM reader of the easy2read� Family, is an UHF multiregional ultra compact reader for low power, high performances UHF RFID applications. With programmable output power in 18 steps from 10dBm to 27dBm, the reader can detect tags at more than 3 mt of distance (depending on antenna and tag dimensions). Due to its low power consumption, the module is specifically designed to be easily integrated in battery powered devices.